A luxury yacht. A personal skipper and stewardess. Deep blue waters shimmering crystal-clear. An open sky full of sunshine. A desolate Mediterranean island. A protected cove. A 17th century tower perched atop steep cliffs. The salty breeze on skin and hair. The setting sun. Your beautiful beloved. That special ring. That famous four-word question: "Will you marry me?" Could the scene be more perfect for a marriage proposal? For Johnny Aintablian, 33, and his girlfriend Ana Mihaela Focsa, 29, it was as perfect as can be. Of course, she said "Yes!" The newly-engaged couple met a little over three-and-a-half years ago at the hospital where they both practice medicine. 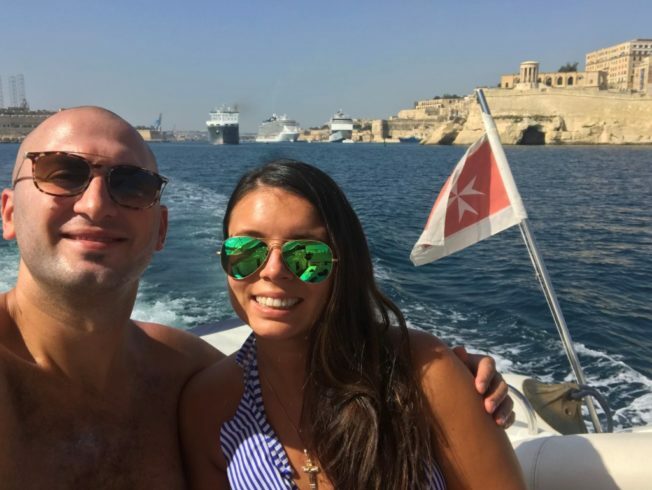 But why would two Canadians, of Armenian and Romanian origin respectively, get engaged on a yacht in Malta – a Mediterranean location they had no prior connection to nor ever visited before? "It is an exotic location with a lot of history and culture, and a lot of beach and sun," Johnny explains, "I wanted to make the occasion very memorable and unique. We both love travelling and the sea." 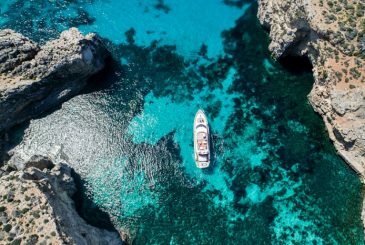 To seal the deal with Malta, Johnny discovered that Azure Ultra could reliably handle his special yacht proposal plans. "I put a lot of time into researching the best charter option for my surprise. While comparing many different companies and options, I always came back to Azure Ultra's website. We both work really hard and like to relax and be worry-free while on vacation. Azure Ultra was the only one offering fully hassle-free, all-inclusive options. And all of the online reviews were stellar." So Johnny picked Malta and Azure Ultra. But, naturally, he wanted to keep it a surprise! Therefore, he went through great lengths to ensure Ana would not guess what he had in mind. "There were many lies and twists and turns. Her friends and family were all in on it so they made sure she didn't grow too suspicious. I would never search anything Malta or Azure Ultra-related on our home's WiFi network because then, if we should start getting Google ads, she'd become suspicious. I was even able to pay Azure Ultra in cash so that the transaction wouldn't appear on the credit card, so as to not arouse Ana's suspicion." Amazing. Johnny hid his plan well, but what did he tell Ana? He was taking her across the globe, after all! "There was a whole sequence of events that led to this (wedding proposal). For her birthday in March, I told her I would take her somewhere on vacation. BUT she wouldn't find out where we were going until we landed. I printed a map of the world, and drew two horizontal lines, and told here we would be going somewhere between these two lines so that she would know how to pack. She only found it was Malta after we landed at the airport! So there was already the whole surprise factor as to the destination of the vacation. Once in Malta, I told her I had booked a yachting activity for the next day, which was also a great surprise. And finally, proposing was the final surprise!" 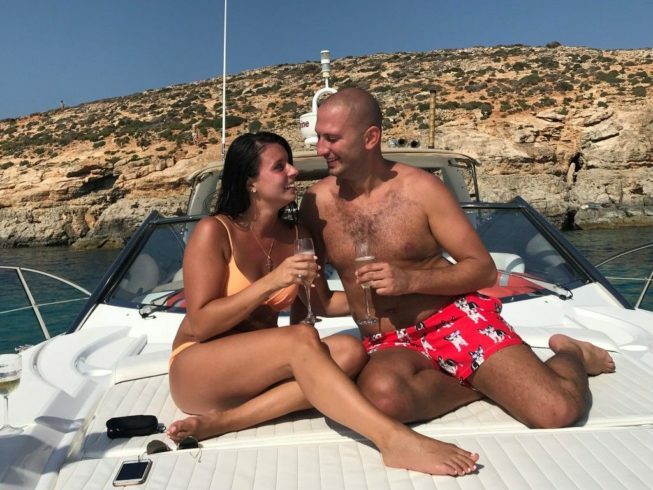 So what did the couple ultimately think about Malta? 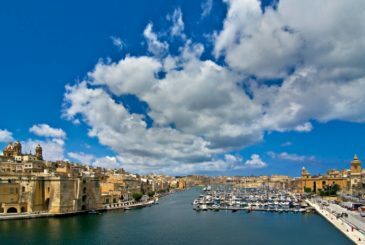 "We love EVERYTHING about Malta. Beaches are gorgeous. People are very friendly. The proximity of everything. Very fine dining options. Great scuba diving sites. And Azure Ultra, of course!" Azure Ultra seems to have really hit the spot with this couple. 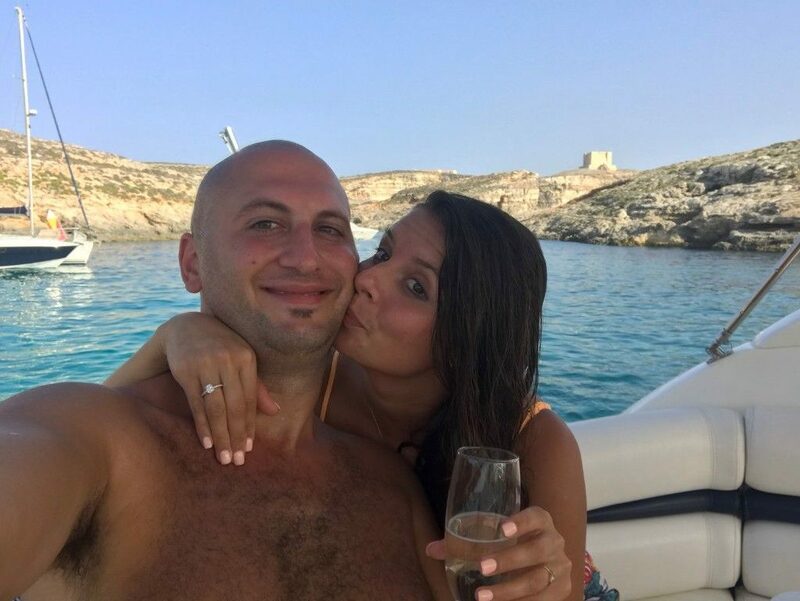 "Proposing and getting engaged on an Azure Ultra yacht in Malta was a very unique and memorable experience. On the day of the trip, the crew was aware of the plan and was very subtle. Luc and Lily (the captain and stewardess) were fantastic. Their service and professionalism were impeccable – they made us feel comfortable from the moment we boarded the yacht. They were very attentive to every detail and we had a great time with them being so friendly. They took us swimming in a cove accessible only by boat. The glass bottom kayaks were phenomenal. The whole day was magical and the activities were great. "Early afternoon, we went to the Crystal Lagoon and enjoyed the rest of the day there. Even though we weren't using the kayaks again, Luc and Lily put them on the water in order to free up the front of the boat – the perfect location for proposing – all the while being very subtle. They prepared a bottle of champagne for the occasion and their choice of music was excellent. It helped us create memories that we will cherish for a very long time. 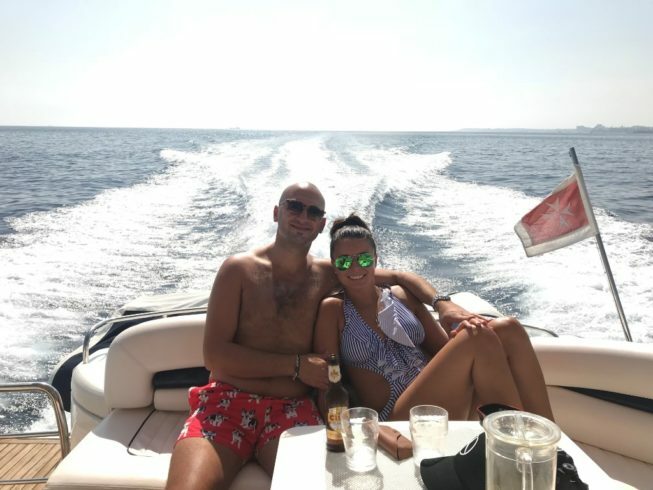 Being away on a trip and especially on a boat as we like, we both felt in our element and that made the moment magical." Asked if they would recommend Azure Ultra to their family and friends, the couple did not need a second thought. "Absolutely, we already have! The experience was great from start to finish. After making the reservation, I received a call from Rosie. I told her my plan and she made sure everything was tailored to our needs. Very easy. Even though we had a very large time difference, Rosie called at our agreed time to finalise the booking. It was really hassle free. The fact that I didn't need to worry about anything else organisation-wise at that point was priceless. 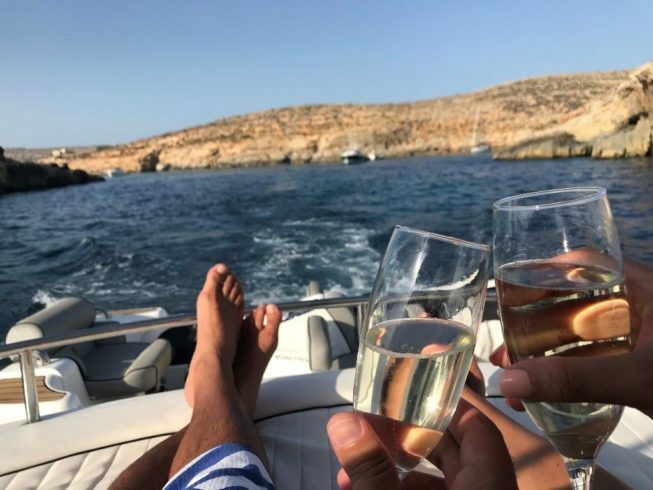 Can you imagine how difficult it would have been trying to plan the boat, professional crew, destination, food, alcohol, ambiance AND keep it all a secret? Impossible. "Azure Ultra provided me with that peace of mind and they therefore deserve a lot of credit. If luxury, comfort and a custom experience is what you are looking for, don't waste your time looking anywhere else: Azure Ultra has everything you need!" Contact Azure Ultra to arrange a romantic cruise or fully customised proposal package to pop the question.